US stocks fell, with the S&P 500 flirting with a correction as technology shares tumbled after a report the Trump administration was set to press its trade war with China. The dollar rallied. The S&P 500 fell as much as 11% from its all-time high before paring the drop in the final 15 minutes of trading. The Dow Jones Industrial Average slid more than 500 points at its worst, dipping into a correction before closing down 1%. The Nasdaq 100 Index tumbled to the lowest level since May. All of the indexes are on track for the steepest monthly declines of the record-long bull market. 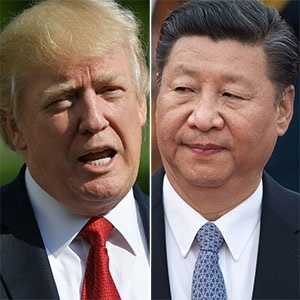 Selling intensified after Bloomberg reported the US is preparing to announce by early December tariffs on all remaining Chinese imports if talks next month between presidents Donald Trump and Xi Jinping fail to ease the trade war. That stoked anxiety in markets already under pressure by concerns from peak earnings growth to the end of easy money and rising rates. More than $8 trillion has been wiped off of global equities during a rout that’s now a month old. Bulls remain on the back foot, with early gains on Monday fueled by speculation stocks had gotten cheap during the sell-off wiped out in afternoon trading. American investors will now turn to earnings this week from tech giants Facebook and Apple, along with the October jobs report on Friday. Earnings have not been able to save other megacap tech names. Amazon plunged 6% on Monday, Netflix lost 5% and Microsoft gave up 2.9%. Boeing led declines in the Dow, with a plunge of almost 6.6%. IBM fell 4.1% after agreeing to buy Red Hat. Elsewhere, there were a host of developments hitting specific markets. Brazilian assets rose after Jair Bolsonaro swept to power. The euro fell as German Chancellor Angela Merkel said she will quit as head of her party after nearly two decades, though she intends to see out her term as head of state. Mexico’s peso was under pressure after the incoming president canceled airport construction. The pound fell as UK Chancellor of the Exchequer Philip Hammond delivered the country’s budget.